Bill is perhaps the ONLY dog trainer in the business that has such a vast experience of working and training dogs not only as pets and companions, but for all aspects of dog work. Bill has trained dogs for the disabled, the police, rescue personnel, explosive and narcotic intervention and cadaver recovery. His understanding of dog control and teaching is unequalled. Contracted by municipalities and cities to address their animal problems, his techniques for solving problems with dogs is refreshing. He began his specialized canine security operation in 1980 from his Scoudouc, New Brunswick kennel. 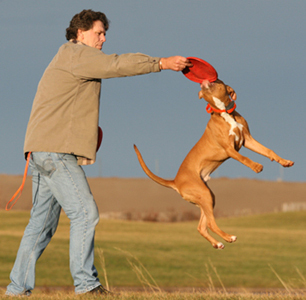 Today, he is an internationally respected and accomplished dog trainer working in the Americas, Caribbean, South America, and Europe. His training ability speaks for itself. 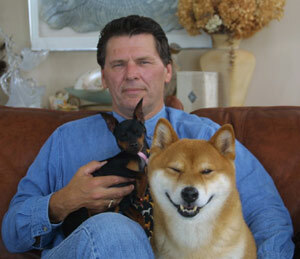 He and his dogs have worked rescue missions in the former USSR and the Austrian Alps. He has trained narcotic and explosive detector dogs for foreign government agencies in United States and South America. Police agencies in Canada and elsewhere regularly sought his assistance and advice. Bill was the recipient of the prestigious YMCA PEACE Medal in 1989 and is designated as a World YMCA Peacemaker for his rescue volunteer work in the Armenia USSR earthquake. Bill designed, taught, and successfully completed a project with the Texas Narcotic Control Program that trained over 100 specialized narcotic detector canines and their handlers. Over 15 million in asset seizures occurred in the 1st year of the 5 year project alone. He has authored 2 training manuals related to service dog work and canine emergency first aid, and his knowledge is formidable on those subjects. Bill also designed and taught two programs for narcotic and explosive detector dogs for the National Police Force of Guyana, South America through CESO, a Canadian organization funded by CEDA. Whether looking for contraband on oilrigs in the North Atlantic Ocean, or along the Amazon River tributaries in South America, his dogs are and continue to be successful. The company of BGMDT K9 is a licensed security company with the New Brunswick and Nova Scotia Police Commissions. Handlers from the company provide a gamut of canine related security services from protection to detection. 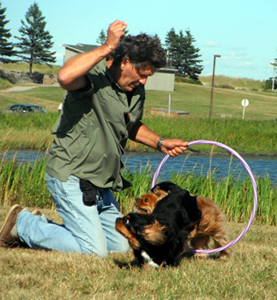 In 2003 Bill built Grimmers Canine College in Shediac with his daughter Vanessa as a partner. Vanessa is an accomplished and renowned animal groomer and she operates the day to day function of the store and shop at 59 Ohio Road. He also operates the security operation from there, however with his increase in age and work developed from the training aspect; he is downsizing the security facet. Bills exhaustive curriculum vitae follow outlining his extensive knowledge in the training and utilization of working dogs. Operator of BGMDT K9, a company using dogs and handlers in various aspects of security work, narcotics recovery, explosive detection and asset protection. BGMDT works internationally and licensed with all appropriate Federal, Provincial and/or State agencies. thank you for your exemplary service you have provided  Bill Hogan, Charlottetown Fire Department Fire Services Manager, for training their accelerant detector dog and handler. During the past several years, accelerant detection dogs have become commonly visible at fire scenes. These professionally trained dogs can detect various flammable and combustible liquid odor residues found at fires scenes. Canines have the ability to detect these odors at low levels. The canine is a valuable tool that can assist the fire investigator in locating these flammable and combustible liquid odors at fire scenes. In the mid 1980's a group of Bureau of Alcohol Tobacco and Firearms (BATF) agents started to research the possibility of using dogs to detect the presents of flammable liquid residues at fire scenes. On May 1, 1986 the State of Connecticut Police began its first training program with a black female Labrador retriever named Mattie. Tests proved that she could detect 17 different odors. There were a few detector dogs in Canada. Tom Hutton of Ontario Fire Marshal's Office and former OPP (Ontario Provincial Police) canine officer has trained at least three accelerant dogs and are in use in Ontario. In Nova Scotia, Frank Savage a former firefighter with Cole Harbour Fire Department, now a Deputy Fire Marshal for the Province of Nova Scotia had success with his Yellow Labrador "Major" which he informally trained and utilized. Once the canine had alerted, a sample should be taken and submitted to a laboratory for analysis and confirmation. The laboratory plays an essential role in the detection of the presence of a flammable or combustible liquid in the submitted sample. Without laboratory analysis, the fire investigator is unable to determine if the sample does indeed contain hydrocarbon residue. It is essential that laboratory analysis is being performed on each and every sample that is taken at a fire scene. Comparison samples should also be taken and submitted to the laboratory for analysis. The canine is a useful tool to assist the fire investigator in the determination of these odors a t the fire scene. The canine should be used as a tool and should not replace the basic investigative skills needed by the fire investigator to determine the origin and cause of the fire. One advantage to using the canine is that the number of samples that are taken at a fire scene can be reduced thus reducing the cost of sample analysis. At this time there is no set of national standards for canine accelerant detection dogs and handlers. Standards are currently being developed as part of National Fire Prevention Association (NFPA) NFPA 921. If the canine does alert, then a sample can be taken from that area for analysis. The canine can decrease the time that it takes an investigator to process the scene. 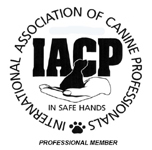 Presently the CADA (Canine Accelerant Detection Association) have standards and perform certifications in North America. Canine accelerant detection dogs have proven themselves as a useful tool to assist the fire investigator. Utilizing an accelerant detection dog as part of your fire investigation can easily be achieved. We offer the use of a certified accelerant detection dog on a nationwide basis. The accelerant dog and the handler can be called to support your Special Investigation Unit investigators or other private fire investigators already on the scene. Utilizing an accelerant detection dog is a time saving and money saving tool that should be used by fire investigators on a regular basis. Once you have seen an accelerant detection dog work at a fire scene, you will realize the important role that these canines play in fire scene analysis. 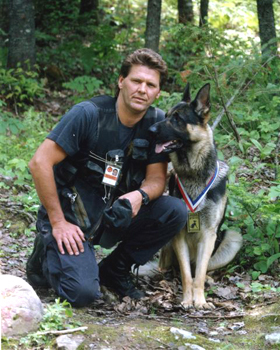 Bill Grimmer has trained the first such detector dog in Atlantic Canada. Working and training with the Shediac Municipal Fire Department the dog is available on a user fee basis to other fire departments, fire investigators and insurance adjusters in the Atlantic area. 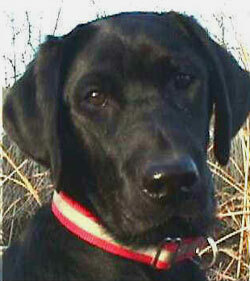 BGMDT's dog is a Labrador Retriever named "FLAME". Flame was the product of a local Moncton breeder "Haddondale Kennels" and was aptitude tested by Bill when only 8 weeks old. She began her initial (first level) training at 13 weeks of age and can easily detect the presence of hydrocarbons at fire scenes. Presently, there is in excess of 155 metric tons of cocaine and 23 metric tons of heroin seized worldwide per year and the street prices have dropped to less than $100. Per gram. There is a lot of money at stake in narcotics and it is thought that almost 70% of the illicit trade destined for the Canadian-US market enters through the Texas-Mexican borders. Educators agree that information is the best way to curb the use of killer drugs and interdiction at the school level necessary to protect our youth. More and more school districts are developing protective plans to find and rid schools and impressionable young children of drug temptations. One of the best eradication techniques involves the use of detector dog teams working in the schools. These teams are privately contracted, police arranged or "in-house" operations and either way competent dogs are needed. A concern of the school districts, parents and students is the perceivable image that detector dog teams makes, small, friendly dogs are always better accepted. New "in-house" school programs have the students themselves handling the detector dogs as a resident mascot.